Who would have thought that watching four women grapple with iced buns, wrestle croissants into shape and take on the art of patisserie would be so compelling? And go home to tea he did. Parker Bowles went on to explain how, like many other Brits, he’d been inspired to do a spot of baking, so had made a dozen cupcakes with his daughter. If only I’d started small with a dozen cupcakes too. But all the food theatre and elaborate baking goaded me into starting big instead. I thought that if the ‘amateur’ contestants could sculpt layered mousse sponge cakes, then being an ‘amateur’ chef myself, I could too. 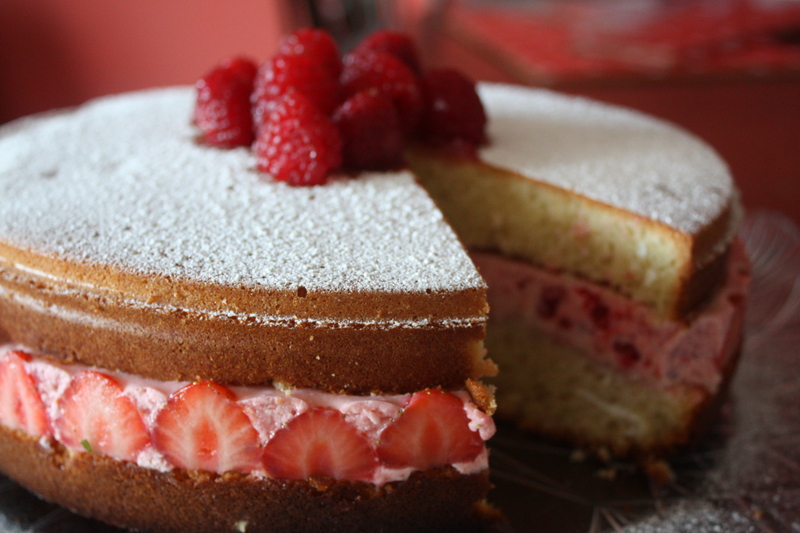 I set aside Saturday afternoon to faff around with genoise sponge (“technically challenging” and “one of the most difficult to pull off” according to The Great British Bake Off) and gelatin (my own personal nemesis). And what did I learn? 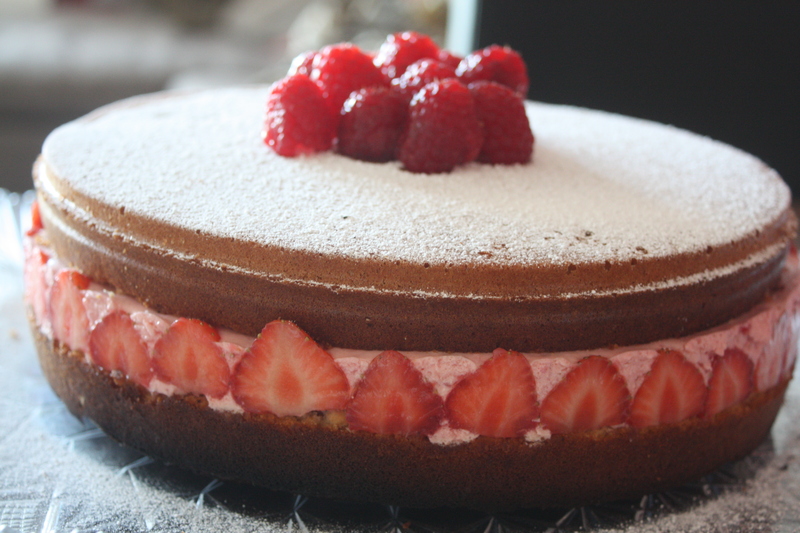 That genoise sponge really was very tricky indeed, and that gelatin really is very temperamental. 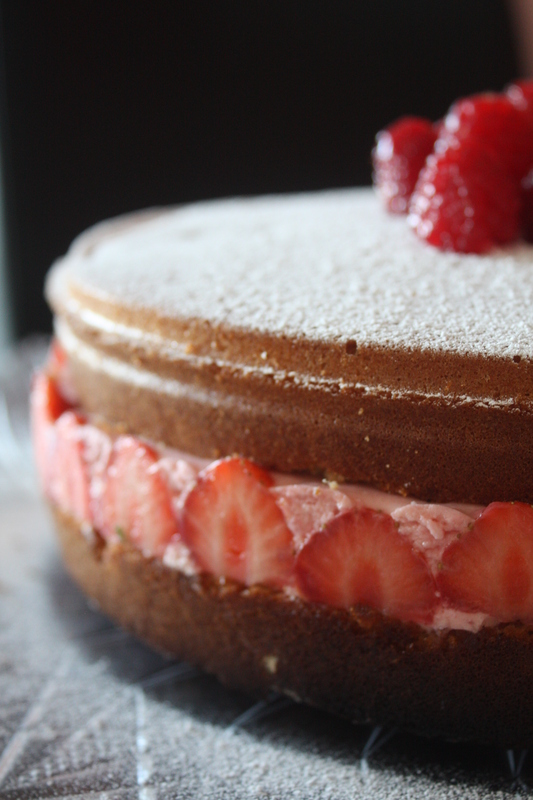 …so, I figured that my cake was a sort of nineteenth century specimen. It looked rather impressive…but it did taste…well…a bit hard. Preheat the oven to 200C and grease your cake tin with a bit of butter. Put the eggs and sugar in large bowl and hover it over a bowl of only-just-simmering-water. Don’t let the bottom of the bowl touch the water. Beat with an electric whisk until the mixture is thick and fluffy then remove it from the pan and beat for about three more minutes. Stir in the melted butter, then fold in the sifted flour using a large metal spoon. Pour the mixture into the cake tin and bake for 25 minutes. Let the sponge cool entirely and then cut in half. Meanwhile, make the mousse. 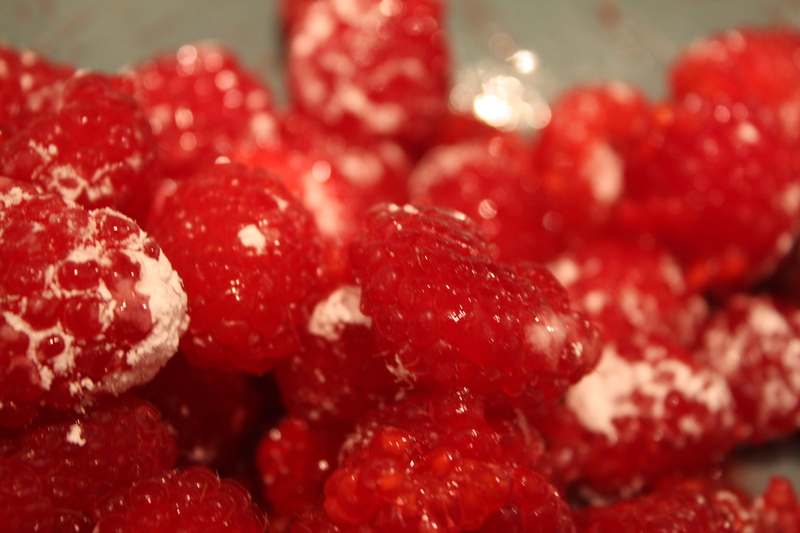 Place 125g of the raspberries in a bowl with the icing sugar and a squeeze of lemon juice. Stir gently until the sugar has dissolved then set aside. Mash the remaining raspberries with a fork, until they’re pulpy but not completely smooth. Place the crushed raspberries in a small saucepan with the caster sugar, heat gently until the sugar has dissolved then remove the pan from the heat. Squeeze the water from the gelatine and add it to the pan, stirring until it has completely dissolved, then mix in the whole raspberries. Transfer the mixture to a bowl and set aside to cool. (You could place the bowl over iced water to speed up the cooling process.) When the raspberry mixture is cold and starting to set, whisk the cream until it forms soft peaks then gently fold it into the raspberries. Use half of the sponge as a base. 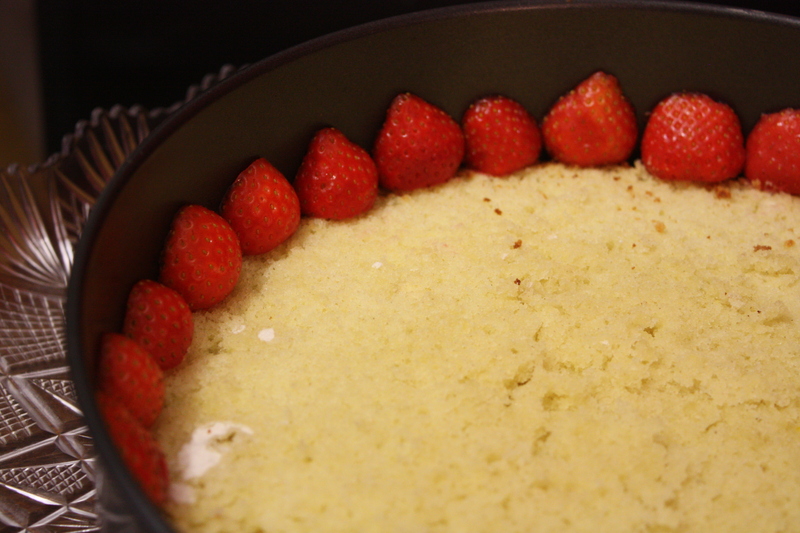 Put the edge of the cake tin (with the base removed) round the base sponge, and then put the mousse mixture on top. If (like me) you want some extra prettiness, then halve some strawberries, and arrange them round the edge facing outwards before you scoop the mousse into the middle. Dust some icing, and (or) arrange some fruit on top which can be glazed by coating it with a little bit of jam and boiling water. Wow! That cake looks absolutely gorgeous! Love your blog, great inspiration! OMG, that cake looks amazing!!!! I can’t bake very well and there’s NO way I could anything like this. it looks simply divine! Looks amazing! Was wondering whether you could achieve the same result with genoise if you were to bain-marie some dark chocolate to add to the batter given that it’d loosen it and possibly change the consistency. Raspberry and chocolate just seems like the obvious combo to me. Thoughts appreciated! Thanks!